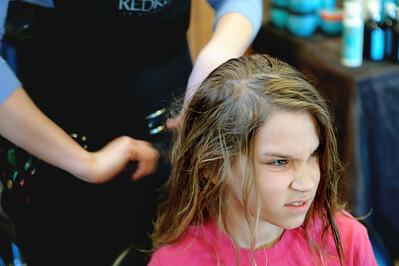 Daniel J. Murphy - dmurphy@shawmedia.com Conner Stevens, 11, of Cary winces as Caitlin Whitney of Crystal Lake cuts his hair Tuesday March 13, 2012 at International Hairways in Crystal Lake. Conner grew out his hair for over a year in order to donate it to Locks of Love on behalf of his godmother, Auntie "Ju Ju" Julie Mc Dillon who is a breast cancer survivor. Daniel J. Murphy - dmurphy@shawmedia.com Caitlin Whitney of Crystal Lake prepares to cut Conner Stevens', 11, of Cary hair Tuesday March 13, 2012 at International Hairways in Crystal Lake. Conner grew out his hair for over a year in order to donate it to Locks of Love on behalf of his godmother, Auntie "Ju Ju" Julie Mc Dillon who is a breast cancer survivor. Daniel J. Murphy - dmurphy@shawmedia.com Caitlin Whitney of Crystal Lake cuts Conner Stevens', 11, of Cary hair Tuesday March 13, 2012 at International Hairways in Crystal Lake. Conner grew out his hair for over a year in order to donate it to Locks of Love on behalf of his godmother, Auntie "Ju Ju" Julie Mc Dillon who is a breast cancer survivor. Daniel J. Murphy - dmurphy@shawmedia.com Caitlin Whitney (left) of Crystal Lake cuts Conner Stevens', 11, (right) of Cary hair Tuesday March 13, 2012 at International Hairways in Crystal Lake. Conner grew out his hair for over a year in order to donate it to Locks of Love on behalf of his godmother, Auntie "Ju Ju" Julie Mc Dillon who is a breast cancer survivor. Caitlin Whitney of Crystal Lake cuts Conner Stevens', 11, of Cary hair Tuesday March 13, 2012 at International Hairways in Crystal Lake. Conner grew out his hair for over a year in order to donate it to Locks of Love on behalf of his godmother, Auntie "Ju Ju" Julie Mc Dillon who is a breast cancer survivor.